First of all, so there's no confusion, this route is NOT on the diamond. It is just filed under that rock. I give this route one star, but not because it is a bad route. It is an excellent first technical alpine route for a beginner. After doing the route, however, I would probably not be interested in doing it again unless it was a winter ascent, which would be different. The history of the route is kinda interesting. I'm not sure of specific dates, but in the early part of the 1900's a thick steel cable was bolted to the rock with huge eye bolts (much like the bolts on the 3rd). Non-technical climbers would use this as an aid to climb up this face of Longs. That is until people started to realize that a 1in. thick cable bolted to the rock for hundreds of feet is a great conductor of electricity. The cable was removed, but a couple of the eye bolts still exist at the belays. This climb is best started from the boulder field at the base of Long's approaching from the East. From the boulder field, the hike is only about 0.25mi. to the start of the climb and about 1.5mi. descent from the backside (W. side) of Long's. Otherwise, you're looking at a 6 mi. hike just to the boulder field with a full pack of gear. Best climbed mid summer through early fall (unless you bring crampons). I climbed it mid-October in 1998 and it was cold and coated with a nice layer of verglass (thin ice). This changed the grade from easy 5.4 to very contemplative 5.6-7ish. There is only really one full pitch of technical climbing, then it's very easy 5th and 4th class for a pitch or so. After this, 3rd class get you to the summit, taking the line toward the edge of the diamond, then back to the summit. The ranger station at the Longs trailhead has a nice 3D model of Longs and a ranger will be happy to show you the exact line. Descent is a downclimb of the same route (raps possible from the eye bolts) or via the standard Keyhole route. Very minimal rack. A few large stoppers and some hexes or tri-cams. Several shoulder slings. A 50m rope is sufficient. Water on the rock taken July 2, 2012. Me rapping from the 1st rap station. Top of the easy, technical stuff. Long's North Face (Cable Route) - January 4, 2013. Above the Cable Route, winter 2013. Ben and Shane on the summit of Longs. One rappel on the descent. Snowfield above the Cable early in the season. Shane Murphy resting after the first pitch. Kevin's comments are right on. There are 3 huge eye bolts (shoulder sling) to a final 4 one at the end of the technical section. They were clear and plain as day to see on a March 22 ascent, and I believe that you'd have no trouble finding them unless the entire ramp was completely covered in snow. I used one additional mid-sized hex between bolts, and the entire technical pitch seemed about 150'. Just did Cables this weekend (4.6.02). Conditions were great on the North side. The first eye bolt at the base of the 5.4 pitch is gone, but the bolt at the top still seemed solid. Still a little ice in the dihedral, so it was nice to have a tool ready at hand, but easy climbing overall. Made the mistake of descending the Keyhole, which was a crappy mix of hard icy-crusted snow and rock. Definitely go back whence you came in the early season. The "tourist" route is just as exposed, longer and more dangerous until it melts out. Climbed on 9/12/04. I've climbed this route twice before (Jan and June '01) and this is the most ice I've ever seen!Bodes well for ice season this year! Unfortunately, it's enough ice to require crampons but not solid or well-bonded enough for good screws or completely comfy tool sticks. The "normal" exit slab is *covered* in thin ice. Much better to go all the way up to the overlap which has a nice iced-up ledge below it and a relatively easy exit left - ice is pretty thick in the corner for this last 50-60'. On Sunday, I rated this climb M-Scary though in retrospect probably M4(+?) right now; definitely harder than the several times I've climbed Dreamweaver.Only good news was good rock pro (yellow #2? Friend, mid-sized nut) at the 2 one-move cruxes, but I really didn't want to fall with all the pointy things I had on and in my hands! Hike up to the boulder field and make a judgment call yourself. Your response to slithering Carl was spot on. which gives a decent view of the route. There was a small stream down this route on August 11. Even with the stream, the route is 5.4 at the hardest. A reasonably experienced leader can easily do this route using only the bolts for protection, though we used one piece between bolts because we brought extra gear. Climbed this as my first climb up Long's yesterday. There was snow and thin ice on much of the route. All the bolts that remain were visible (there are four, I think). Altitude, the approach, and the slick rocks made it feel harder than 5.4. Subjective: Very fun climbing and a great alternative to the mobs on the Keyhole. Pretty quick way up and certainly down the mountain. Roped up at the upper ledge. It's easy enough to solo up to here. 1 pitch from the upper ledge. The whole dihedral was soaked, but the climbing is very easy, 5.4 at most. I placed 1 piece in addition to slinging the 4 bolts and that will be more than sufficient for any reasonably experienced leaders. There is a short bolt (4th?) right at the end of the technical section followed closely by a longer bolt (5th?) that is a great belay point. By downclimbing just a few feet from the long bolt (5th) a single rap on a 70m got us to the upper ledge, just. Did this on Sunday, and on the way up following my partner, I took the slings off the huge eye bolts thinking to myself bomber! 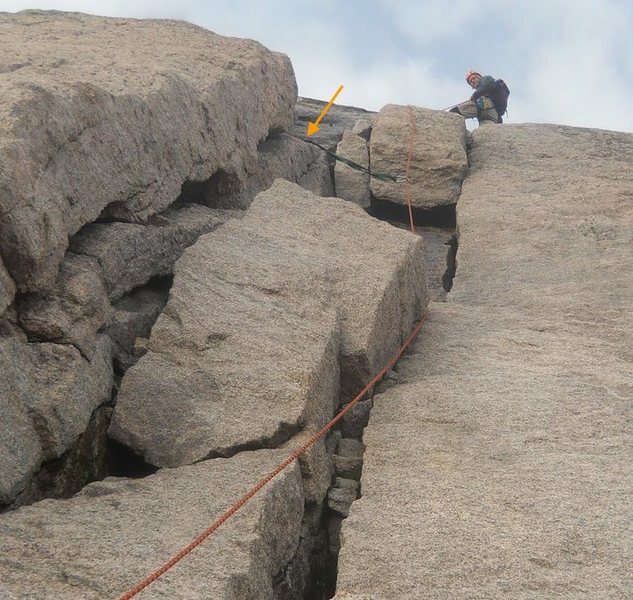 We made it to the top of Long's and came back down the same way, rapping off one of the upper eye bolts for the first rap and rapping off the eye bolt next to the crux for our second rap (I think this is the second eye bolt up that you run into, see pic). As my partner rapped I checked out the eye bolt and noticed a decent-sized fracture in the shaft. I also watched it flex a bit each time she shifted her weight on the rope. The shaft also appeared to be a hollow cylinder not solid steel throughout which isn't surprising, but I don't think helps with the fracture. Probably fine but not the bolt I'd pick to rap off next time around. Could be a good idea to chop it (good workout @ 13,000+ feet). I noticed there were a number of other bolts that have either sheared off or were chopped at some point. In good conditions (no water, ice, or snow), there is no reason that a climber comfortable with leading 5.9 cannot solo this route without gear. There are only about 15 feet that could be considered 5th class climbing, and it's right at the beginning. After that, you have roughly 70 feet of slab reminiscent of the final approach on the Keyhole Route (just a bit steeper) before the scramble to the top begins. I agree with Demyanek, lugging gear is way more of a pain than it's worth. Bringing an 8mm (60m) rappel line is definitely worth it, but leave the rock rack at home if conditions are good. The Cable Route on the North Face of Long's Peak takes its name from the hardware that was installed circa 1925. When the cables were removed in the early 1970s, a few of the anchors were left in place, and climbers have been using them to belay and rappel ever since. Now, these often-used eye bolts are showing signs of fatigue. For safety sake, it is time to consider alternatives to the regular use of this 90 year old hardware. As attractive hazards, should the original bolts be removed or left in place as historical curiosities? Should the Cable Route be returned to its original, hardware-free state or would modern anchors, placed at single rope rappel intervals and positioned for year-round access, be the best choice on this frequently visited route?